With 94% of email classified as junk, sorting good email from bad can be an administrative nightmare. 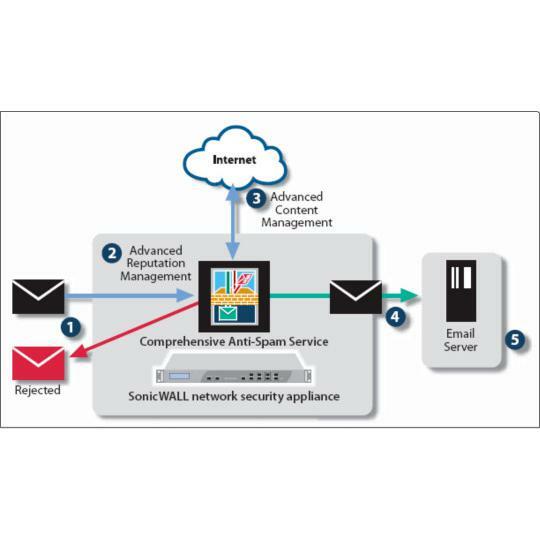 By adding SonicWall Comprehensive Anti-Spam Service (CASS) to a SonicWall firewall, your business can remove junk email at the gateway and quickly ensure the delivery of only good email to your email server. With one-click activation, businesses with up to 250 users can easily stop spam before it enters the network. Recommended for businesses up to 250 users, CASS speeds deployment, eases administration and reduces overhead by consolidating security solutions. And it couldn't be easier to set up. It takes only minutes to configure CASS, and only one click to activate. Once activated, CASS immediately starts to block spam, phishing and virus-laden email. MX Record redirection is not needed. CASS offers 98% effectiveness against spam, dropping 80% of spam at the gateway, while utilizing advanced anti-spam techniques like Adversarial Bayesian filtering on remaining email. Junk email is blocked and rejected at the gateway, before it enters your network. The SonicWall firewall becomes your single point of management for all traffic going through the device, including spam management. Smaller businesses can leverage their existing investment in a SonicWall firewall to quickly ensure the delivery of only good email with CASS. Larger enterprises can layer their anti-spam protection by placing CASS in front of a SonicWall Email Security solution. CASS offers complete inbound anti-spam, anti-phishing and anti-virus protection, with the SonicWall Global Response Intelligent Defense (GRID) Network, IP reputation analysis, Advanced Content Management, full quarantine and customizable per-user junk summaries. Spam, phishing and virus protection. 14 different techniques - including advanced IP reputation, SonicWall GRIDprint analysis and Image Inference analysis - not only block spam, phishing and virus emails, but also ensure delivery of good email. 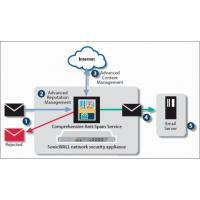 SonicWall Advanced Reputation Management utilizes Sender IP Reputation to drop junk email at the connection level, before it enters the network. Real-time reputation scores from the SonicWall GRID Network identify and block junk email from spammers. Every five minutes, the SonicWall GRID Network updates GRIDprint and IP reputation information for each SonicWall email protection solution, including LDAP entries, spam word-and-phrase content, and SonicWall GRID Anti-Virus, McAfee and/or Kaspersky anti-virus signatures. Phishing emails are placed in a designated Phishing Folder, reducing the risk of having financial, personal or proprietary information lost through an email-based phishing attack. Administrators can deploy or delete Junk Boxes for users to store junk messages. With optional Junk Box Summary emails, users can view text emails designated as junk, with IT retaining control over delivery of summaries and settings. With Allow and Block lists, administrators can easily block or allow emails from specific people, company, and addresses on both a global and per-user basis. Flexible LDAP integration enables easy and secure user management with support for multiple LDAP servers.